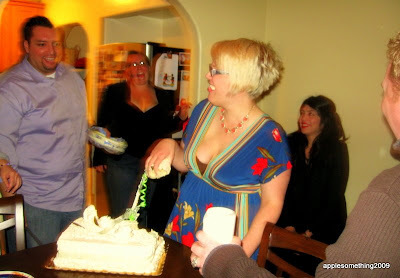 My husband threw me a sweet birthday party Saturday night. My mother-in-law had both girls overnight (for the first time) so we could have as much fun as possible and not worry about waking the girls up with loud laughter or music. We played Pin the Tail on the Donkey, sang Happy Birthday, danced, ate chips and candy, all the usual birthday-party-type things. This was my first birthday party in a very long time. I don't even remember the last one I had. I even got gifts! I thought I was too old for that! Jose brought home a cake from a local bakery. After I blew out the candle, I took my hand and grabbed a huge chunk of cake and ate it from my hand. I never got to do that before and I really enjoyed it! Several of the gifts I received did not have a card attached so I don't know who each one is from, unfortunately. 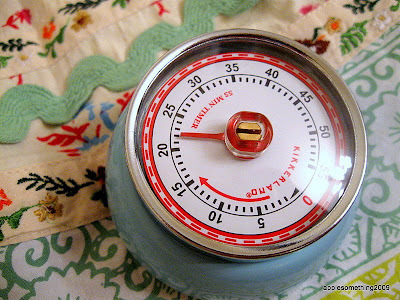 I got a really pretty vintage-inspired apron and timer (above) from my friends Kitty and Sean. My friends Jeff and Sara got me a vintage cookbook (Jeff knows me too well!). My brother James and his girlfriend Ally got me a miniature rose plant (that looks SO pretty in my kitchen window). 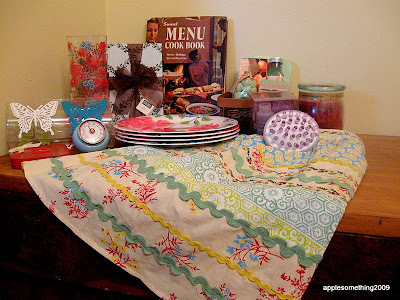 Other gifts: bath fizz/bubbles, a yummy cranberry candle, 2 fancy journals, melamine plates/cups and matching napkin holders, Target giftcard, bath scrubby-thingy and a bottle of merlot. Oh, and my mother-in-law dropped by earlier in the day with a dozen red roses for me. Her late mother and I share the same birthday, February 20th. Talk about a happy birthday. I felt pretty special. Sure wish we could do that more often. Oh Sarah! I missed you this birthday. I want to give you something when I get back on my feet! I am so glad you had a good time on your day! You looked great! That top you are wearing looks really pretty on you! Though I wouldn't have exactly been the liveliest character at the party I would have liked to celebrate your birthday with you. I'm glad you spent it in good company.